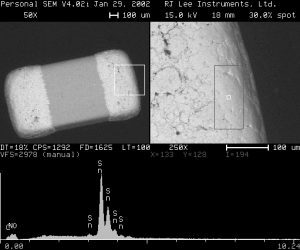 Solder Joint Analysis - SEM Lab Inc.
Solder joint analysis is an important factor in determining the reliability of electronic assemblies. Solder joint defects can contribute to thermal, mechanical and electrical variations in devices and assemblies. SEM Lab, Inc. has extensive experience in solder joint metallurgical, quality and reliability analysis. SEM Lab, Inc. does detailed root cause analysis of solder joint failures which includes gold embrittlement, thermal and vibration fatigue, tin whiskers, electromigration, corrosion, intermetallic compounds, head-in-pillow defect, and black-pad-syndrome. The amount of lead (Pb) in solder joints can affect reliability. Lead-tin (Pb-Sn) surface finishes on electronics components should have a minimum of 3% Pb to avoid tin whiskers, but often lead-free solder is employed. SEM Lab, Inc. uses SEM/EDS data from Sn-Pb standards to verify the solder composition.